This is the second of our tastings for our Bourbon month and to be able to get hold of a 27 Year Old Whiskey fills both Jim and Nicola with excitement. 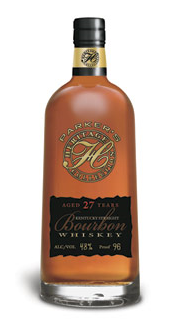 Parker’s Heritage Whiskies is set of limited edition Whiskeys to honour the 6th generation distiller Mr. Parker Beam for his almost 50 years in the distilling industry. Some facts about Heaven Hill Distillery. It is one of the USA’s largest independent and family owned producer of distilled spirits. This distiller has filled more than five and a half million barrels of Kentucky Bourbon since it was founded after the end of prohibition. It has the second largest number of old Kentucky Whiskey in the world, with over 800,000 barrels which is almost 17% of the future supply of Bourbon Whiskey. Heaven Hill’s Whiskeys are produced at Bernheim Distillery. Enough about the distiller lets taste this old dram. Nose…Lots of sweet rich fruit with a wee touch of dark rum. Taste…Creamy vanilla ( almost chewable ) and a really smooth complex dram with dried fruit being very evident and who opened the tobacco jar? Finish…Long and very pleasant, lots of oak. Nose…First was the emulsion paint then in came the heavy dark rum and raisins. Taste…Did not expect it to be this smooth after such a complex nose, delicious, leathery and fruity. Finish…Long and very enjoyable,sits right in the middle of being either a Scotch or a Bourbon. This Bourbon could be sipped all night long and a bottle of this sitting in your cabinet would not be out of place amongst some grand Malt Whiskies from Scotland. This tasting makes us both look forward to our next Bourbon tasting in a few days time. 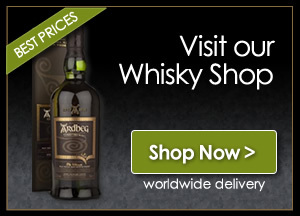 This is not a cheap bottle, but it is available via the internet and maybe from some specialist Whisky shops. Again we thank all at Master of Malt for their sponsorship of our Bourbon Month.